With LunaRich X we’ve further refined LunaRich to isolate the lunasin itself. The result is a product that delivers concentrated lunasin extract in a convenient capsule form. 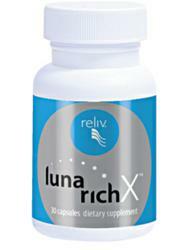 Reliv International (NASDAQ: RELV) has launched LunaRich X™, the most pure, concentrated form of lunasin ever produced. Lunasin is a naturally occurring peptide scientists have identified as responsible for many of soy’s documented health benefits, including cholesterol reduction and general cellular health. In February 2012 Reliv introduced LunaRich® soy powder, which provides up to 10 times the amount of bioactive lunasin found in ordinary soy powders. “With LunaRich X we’ve further refined LunaRich to isolate the lunasin itself,” said Dr. Carl Hastings, Reliv Chief Scientific Officer. “The result is a product that delivers concentrated lunasin extract in a convenient capsule form.” Learn more about LunaRich X. Just one 125mg capsule of LunaRich X delivers the same amount of bioactive lunasin found in 25 grams of high-quality soy protein, the daily amount identified by the Food and Drug Administration to help reduce the risk of heart disease. LunaRich X marks the culmination of an extensive research and development process that began with the discovery of the lunasin peptide by research scientist Dr. Alfredo Galvez at UC Berkley in 1996. Lunasin is now one of the most heavily researched and scientifically supported nutritional compounds available today, with more than 50 published papers from more than 25 research institutions. Lunasin is among the first bioactive compounds identified to affect gene expression and promote optimal health at the epigenetic level. The epigenome, which literally means “beyond the genome,” is a higher level of complexity within the cell. Every cell in the body, from the brain to the toenails, contains the same DNA, or genome. The epigenome consists of DNA packaging material and determines cell function by signaling the genome which genes to turn on and off. The epigenome also influences how well each cell functions. In the epigenome, the right lifestyle choices trigger healthy gene expression — the healthy genes get switched on, the unhealthy ones get switched off. Lunasin can attach itself to the epigenome in the cell. As a result, it can increase expression of important genes needed for normal cell functioning and protect the cells from environmental damage once it occurs. Learn more about lunasin and epigenetics. Studies show that increasing the amount of lunasin consumed increases the health benefits received. Along with the launch of LunaRich X, the scientists at Reliv have enhanced all LunaRich soy powder products to deliver the same amount of bioactive lunasin per serving. Now consumers can determine the LunaRich they need for optimal health through a simple point system: one serving of any LunaRich product = one LunaRich point. Learn more about LunaRich points. Reliv International, Inc., based in Chesterfield, Missouri, produces nutritional supplements that promote optimal nutrition. Reliv supplements address essential nutrition, weight loss, athletic performance, digestive health, women's health, anti-aging and healthy energy. The company sells its products through an international network marketing system of independent distributors in 15 countries. Learn more about Reliv at http://www.reliv.com, or on Facebook, Twitter or YouTube. LunaRich X Product BrochureLearn how the soy peptide lunasin supports optimal health at the cellular level, how LunaRich X delivers the most concentrated form of lunasin available anywhere and how these breakthrough capsules power up the benefits of all Reliv products. "What's Your Point?" BrochureDefinitions, descriptions and examples of how a personalized LunaRich points plan can optimize good health.